Image searches may still constitute a fraction of the total search volume on Google. But visual-heavy social media networks are already a "favourite" among avid shoppers. According to Pinterest – a platform where an estimated 600 million monthly searches are performed through the visual Lens functionality – the majority of users come to the platform in a buying-state-of-mind. Some 87% of users said that the platform helped them make a purchase decision, 93% use Pinterest to plan purchases and an average shopper referred from Pinterest spends $50 per order. Our comprehensive guide to Search Engine Optimisation best practices isn't just for SEOs, the clear explanations mean that it can be used by marketers to ask the right questions to boost their SEO. E-commerce companies should take note of this trend. As found by Gartner, in two years brands that have redesigned their websites to support visual and voice search will increase their revenue by 30%. This should come as no surprise, considering that 62% of Millennial and Gen Z consumers want brands to deliver mobile visual search functionality more than any other new technology. However, in 2017 only 8% of e-retailers offered on-site image search of their inventory. Today, we can assume the figure is somewhat higher, but the majority of e-commerce companies are yet to fully exploit new marketing opportunities brought in by visual search. But those who have already created a new type of customer experience, backed by visual search, are seeing major returns on their investments. The following five use cases illustrate how you can hop on the visual search trend. In short, shoppable content (videos, blog posts, images, etc.) allow brands to present an interesting narrative to shoppers, spark their interest and fuel their inspiration, while also offering a direct purchasing opportunity for highlighted products. Storytelling isn't a new sales technique, but by making the experience highly visual and interactive brands are seeing a greater return on their investment, according to a recent report by Styla. Traditional content marketing drives product awareness by building a story around it. However, there’s still a considerable gap between the act of selling and the act buying. Often, consumers need to go through several stages before they are actually able to place an order. Shoppable content eliminates this friction. A recent ViSenze survey found that 70% of consumers state that they would enjoy a retailer’s on-site experience more if all the digital content was shoppable. Knowing their audience preferences, Net-A-Porter, a popular luxury fashion retailer, regularly curates shoppable looks on their Porter blog and in their branded mobile app, offering consumers a quick getaway to instant inspiration and seamless purchasing. Social media is heavily influencing millennial shopping decisions. The majority of younger consumers now want to instantly shop what they have seen on someone else online or in real life. 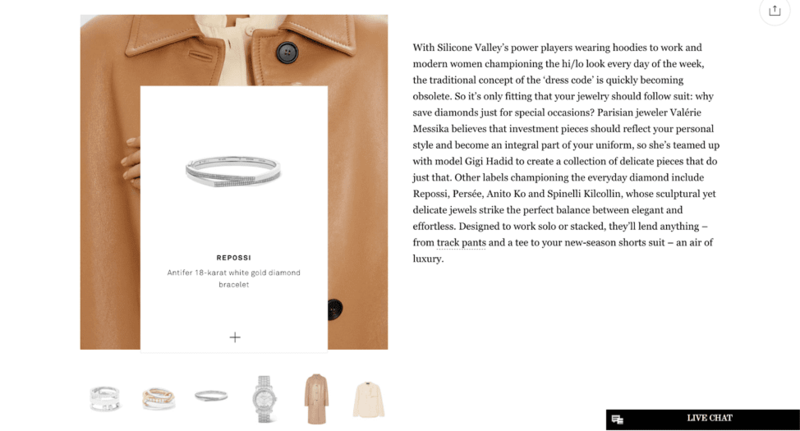 Shoppable content partially addresses this demand for "as seen on" shopping experience. Boohoo, a clothing brand popular with younger consumers, noticed that as a lot of their trendy styles sell out fast, frustrated shoppers abandon their website without looking for alternatives. To create a better product search and recommendation experience, the company recently partnered with Syte – an image recognition platform for e-commerce brands. Together, they have introduced the new on-site visual search bar for mobile shoppers. Using the Camera Button, users can upload an image and find the most visually similar products available on the website. On top of this, they are treated with additional product recommendations of similar styles. Shoppers who opted to use this search feature converted at a 100% higher rate than those who used the traditional search. Camera-powered visual search has also generated a 135% increase in page views per session and a 12% increase in average order value. 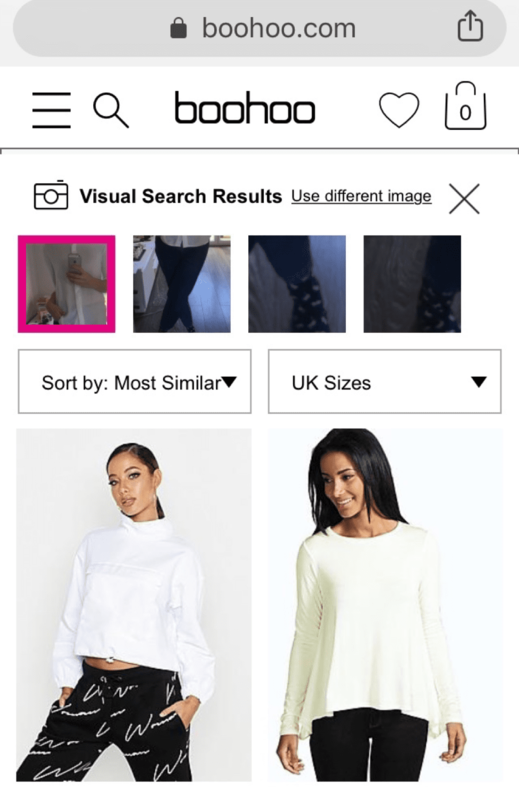 Boohoo isn’t the only mass market retailer out there experimenting with visual search. Forever 21, Asos and H&M also launched on-site visual search tools last year. 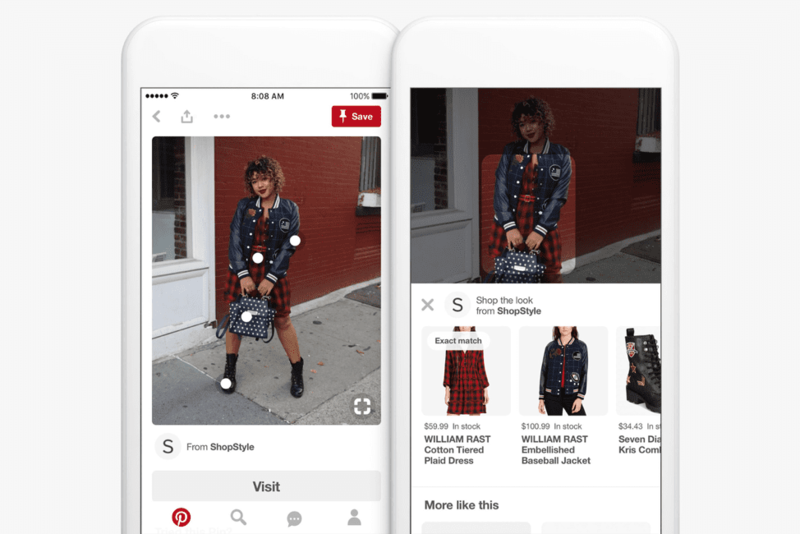 Pinterest Lens is a new visual search tool offered by Pinterest for mobile users. Pinners can upload images from their camera roll or point their camera directly at an object to find similar-looking products on the platform. The company's proprietary technology already recognizes objects in more than 750 categories and recently partnered with ShopStyle to bring over five million new shoppable products across 25 thousand brands to the platform. 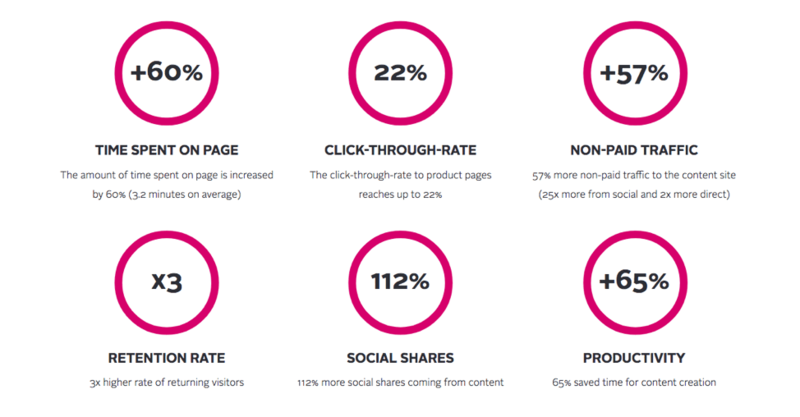 To increase the chances of being "spotted" by a Lens, brands should optimize their Pins for maximum visibility. First, it’s important to use relevant, on-brand keywords in the title and description of your pin, as these will be picked up during scanning by the platform’s visual search engine. Your keyword strategy should be aimed at creating a strong visual identity around your brand. Use on-site guided search to browse various semantically related modifiers for your set of targeted keywords. You will then get a good sense of what's trending on the platform and what are the popular keywords in your niche. To further test our assumptions, you can also take your best-performing keywords on Google and create Promoted Pins around them to see if the results will compare. Finally, you can always consider direct partnerships with Pinterest or influencers from ShopStyle network to help you promote your products to consumers. Google has been actively investing in the visual search experience as well. Last year, the search engine massively updated its desktop image search functionality to make it more effective, accessible and easy-to-use. Google Lens is the company's next step towards transforming the visual search experience. Currently available as an Android app and camera add-on, Google's product operates in a similar way to Pinterest Lens. Users can point their camera at all sorts of objects around them (geo locations, plants, animals, products, etc.) and obtain more information. 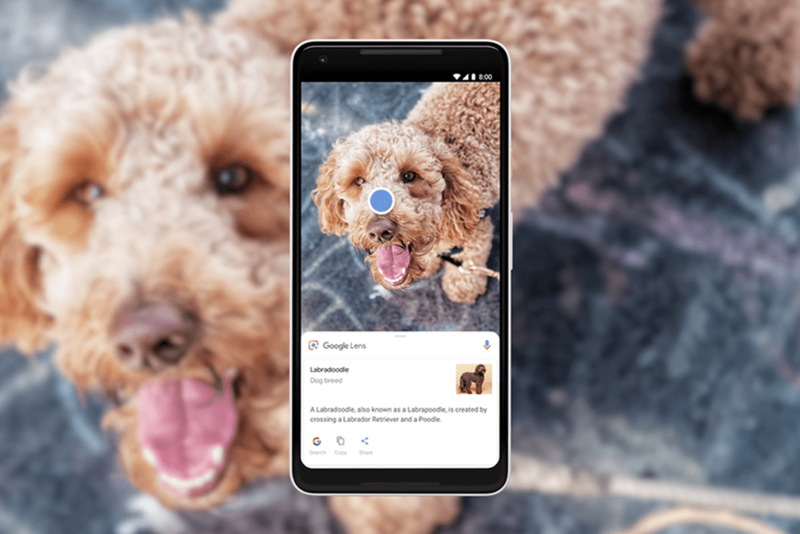 Google Lens will allow users to not only understand what they see but also help them take further action. Incorporate clear branding: To get recognized by the Lens, your products should come with distinguishable branding and logos. Brick-and-mortar businesses should also consider investing in prominent signage. For instance, an Oxford summer school should make its branding visible from the street view and ensure it's consistent with the images provided in Google My Business profile to improve their chances of getting picked up. Optimize alt tags: Ensure that your image metadata is in order and properly cultivated with detailed insights. This includes optimizing alt tags for all visuals, texts accompanying photos and anchor texts for image links. Update the Exif data: The photo file metadata (image size, geo coordinates, date taken, etc.) is another asset worth optimizing for better image search rankings. Sentiment analysis is hardly a new trick for e-commerce brands. But as social media platforms are leaning more heavily on the visual side, the standard NLP (natural language processing) tools may no longer be enough to understand what consumers are saying about your brand. On Instagram, over 100 million images are posted daily and an additional 500 million people use Instagram Stories. These conversations happening through images remain a terra incognita for brands, even when they are sponsoring those "talks". According to MDG Advertising, 44% of brands cannot measure the ROI of their social media marketing campaigns or directly attribute any positive action (e.g. sales) to a certain initiative. Selfies and other user-generated content featuring their product/logo, and assess the sentiment around it. Product/logo placements outside (e.g. at the beach). Product placements and visual engagement with sponsored campaigns. Visual sentiment analysis and social listening can get you one step closer to what Google is trying to achieve through their lens technology, allowing you to gather more context and behavioural cues around certain consumer actions and apply them towards better CX. Visual search technology is rapidly moving from the margins to the mainstream. Consumers are already demanding a better visual experience and e-commerce brands who deliver it gain a significant edge. As described in this post, there are several ways to benefit from the visual search trend: optimize your visual assets for rankings on visual platforms, transform the on-site search experience and engage in visual, shoppable storytelling. Now is the high time to start experimenting with at least one of these options if you want to future-proof your e-commerce revenues. Dima Midon is the founder and CEO of TrafficBox, where he helps his clients build powerful brands through content marketing, social media marketing, search engine optimization, email marketing, pay-per-click advertising and web design.